The Premier Rapid Jet Print Washer is a fast efficient and economical way to wash your prints. Water from 21 powerful jets gushes constantly to separate and wash both sides of prints quickly and completely. The Agitating water engages and dilutes the hypo, carrying it through the washer and out the opposite side quickly. The Rapid Washer accommodates 10 to 12 11 x 14" prints in one loading. 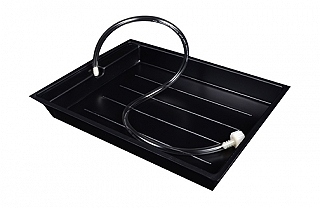 It is made from jet black Hi-impact styrene, and attaches to most faucets. Wash Slots: Not applicable, its an open tray type washer. Dimensions: 12 x 16 x 3"
Box Dimensions (LxWxH): 19.5 x 14.7 x 2.7"